What do we mean by the locus of a point? Locus of a point is defined to be the path of a point satisfying some geometrical condition; i.e. constraint equations. The path represents a curve, which includes all the points satisfying the given condition. A circle is defined as the locus of a point which moves in such a way that its distance from a fixed point is always constant and positive. The fixed point is called the centre of the circle and the given distance the radius of the circle. For eg: In real life, when you rotate a stone tied with one end of a string then the path followed by stone is exactly a circle whose centre is your finger an radius is length of the string. which is the required equation of the circle. (1) If xc = yc = 0 (i.e. the centre of the circle is at origin) then equation of the circle reduce to x2 + y2 = r2. (2) If r = 0 then the circle represents a point or a point circle. The perimeter of any figure refers to the sum of the boundaries. Similarly, in case of a circle, the perimeter is given by the circumference of the circle. 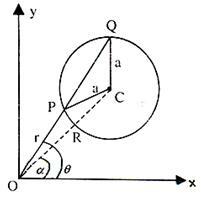 (i) The simplest equations of the circle is x2 + y2 = r2 whose centre is (0, 0) and radius ‘r’. (ii) The equation (x – a)2+ (y – b)2 = r2 represents a circle with centre (a, b) and radius r.
(iii) The equation x2 + y2 + 2gx + 2fy + c = 0 is the general equation of a circle with centre (–g, –f) and radius √(g2+f2-c). (iv) Equation of the circle with points P(x1, y1) and Q(x2, y2) as extremities of a diameter is (x – x1) (x – x2) + (y – y1)(y – y2) = 0. This gives the parametric form of the equation of a circle. The locus of middle points of a system of parallel chords of a circle is called the diameter of the circle. The diameter of the circle x2 + y2 = r2 corresponding to the system of parallel chords y = mx + c is x + my = 0. (a) Every diameter passes through the centre of the circle. (b) A diameter is perpendicular to the system of parallel chords. Let O be the origin, or pole, OX the initial line, C the centre and ‘a’ the radius of the circle. Let the polar co-ordinates of C be R and α, so that OC = R and ∠XOC = α. Let a radius vector through O at an angle θ with the initial line cut the circle at P and Q. Let OP be r.
This is the required polar equation. r2 – 2Rr cos θ + R2 – a2 = 0.
i.e. r = 2a cos (θ – α). This is at once evident from the figure given above. r = 2a cos θ. 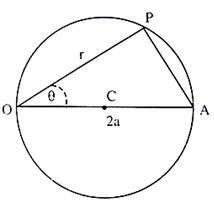 ∠PRQ = π/2 (Angle subtended by diameter at any point on the circle is a right angle). Centre of the circle is (–g, –f), Radius = √(g2+f2-c). Equation (1) is also written as S = 0. 2. If g2 + f2 – c = 0, circle is a point circle. 3. If g2 + f2 – c < 0, the circle is imaginary. The locus of the point of intersection of two perpendicular tangents to a circle is called the director circle. 1. 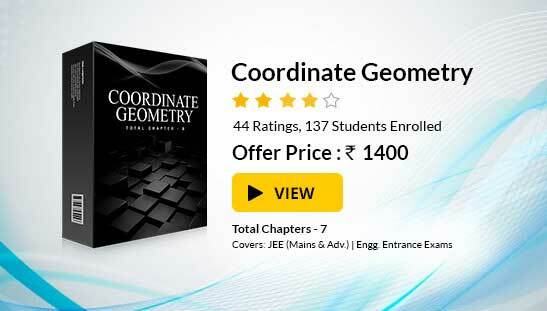 Director Circle is a concentric circle whose radius is √2 times the radius of the given circle. 2. The director circle of circle x2 + y2 + 2gx + 2fy + c = 0 is x2 + y2 + 2gx + 2fy + 2c - g2 - f2 = 0. Find the centre and the radius 3x2 + 3y2 – 8x – 10y + 3 = 0. We write the given equation as x2 + y2 – 8/3 x – 10/3 y + 1 = 0. Find the length of intercept on y-axis, by a circle whose diameter is the line joining the points (-4, 3) and (12, -1). This gives the eqaution as x2 + y2 – 8x – 2y -51= 0. Hence intercept on y-axis is 2√f2-c = 2√(1-(-51)) = 4√13. A circle has radius 3 units and its centre lies on the line y = x – 1. 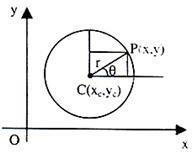 Find the equation of the circle if it passes through (7, 3). ⇒ β = α – 1. Hence the centre is (α, α – 1). ⇒ α2 – 11α + 28 = 0 ⇒ (α – 7) = 0 ⇒ α = 4, 7.
x2 + y2 – 8x – 6y + 6 = 0 and x2 + y2 – 14x – 12y + 76 = 0. Find the equation of the circle whose diameter is the line joining  the points (–4, 3) and (12, –1). Find also the intercept made by it on  the y-axis. (x + 4) (x – 12) + (y – 3) (y + 1) = 0. On the y-axis, x = 0 ⇒ – 48 + y2 – 2y – 3 = 0. ⇒ y2 – 2y – 51 = 0 ⇒ y = 1 ± √52. Hence the intercept on the y-axis = 22√52 = 4√13. Find the equation of the circle passing through (1, 1), (2, –1) and (3, 2). Let the equation be x2 + y2 + 2gx + 2fy + c = 0. 6g + 4f + c = –13. f = –1/2; g = –5/2, c = 4.
x2 + y2 – 5x – y + 4 = 0. Write general equation of a circle centered at a point on x-axis. Find the equation of circle shown in figure given below in polar form. Clearly, OC is the radius. Hence, we have OP = OA cos θ. This means r = 2a cos θ, – θ/2 ≤ θ ≤ θ/2, where a is radius of circle. Find the co-ordinates of the centre of the circle represented by r = A cos θ + B sin θ. 2. The circle x2 + y2 + 2gx + 2fy + c = 0 makes an intercept on x-axis if x2 + 2gx + c = 0 has real roots i.e. if g2 > c. And, the magnitude of the intercept is 2√(g2-c). The point P(x1, y1) lies outside, on, or inside a circle S ≡ x2 + y2 + 2gx + 2fy + c = 0, according as S1 ≡ x12 + y12 + 2gx1 + 2fy1 + c is greater than, equal to or less than 0. Fast Track your revision with the ultimate Revision Notes on Circle.